Happy Saturday! Time to wakey wakey and rise and shine – have some coffee and catch up on the 24 tags of Christmas from this week if you’ve missed any! Be sure to comment on the blog posts to qualify to win one! The tags in this video are distressed – but with colored pencil. Don’t believe me? Check it out! Watch the video below or click HERE to see it in HD on YouTube. The distressing technique works on cards too! I might be the first person to distress with colored pencils – if you know someone else doing this, let me know! 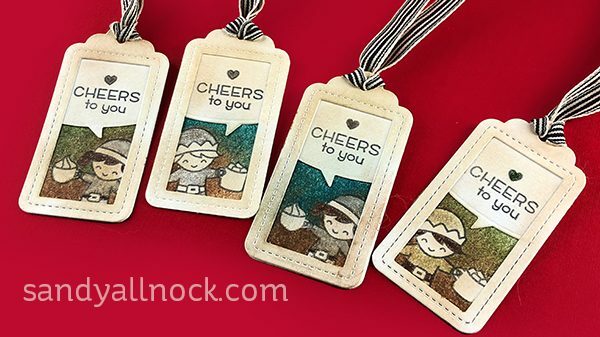 Each year I make 24 tags – and give them away in a random drawing! This year I’ll be trying things a little differently; in the past I picked 2 people from YT comments and 2 from blog comments….but I found a lot of the YT folks never came to find out they won, and I had no idea how to reach them in many cases. So…this year, it’s all about blog comments where I can at least reach out to winners! So leave comments on each blog post this week for the opportunity to be in the drawing! View prior years’ tags by clicking HERE! Great idea, the distressing with colored pencils. Who would have thought to use coffee!! 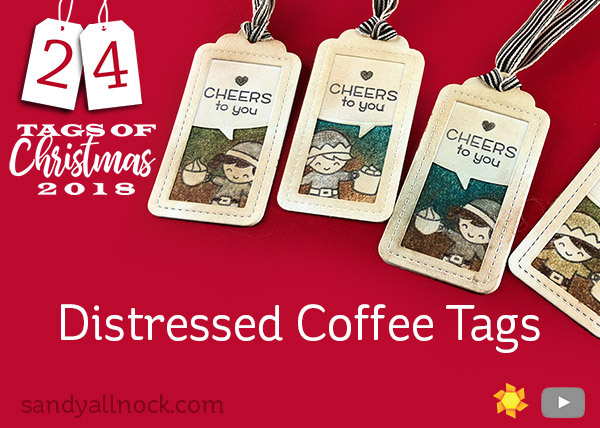 I think these tags look a little like luggage tags – so appropriate when so many are traveling at this time of the year — and I’d travel anywhere for coffee! Great set of tags – thanks! I’m glad I just found you and your lovely tags. I love your ideas, talents. I love my colored pencils, thanks for showing how to distress with them, I can’t wait to try it myself! Super adorable tags! What a wonderful idea! I love them! Can’t go wrong with coffee! Love them and the card is great! Love the layers. So classy. Loved the distress technique using colored pencils and the tags. What fun tags and what a great technique, to distress with these pencils. And 4 tags x 6 days makes 24. It was over too soon! Thanks for your continued inspiration! I”m really enjoying your Christmas tag series. 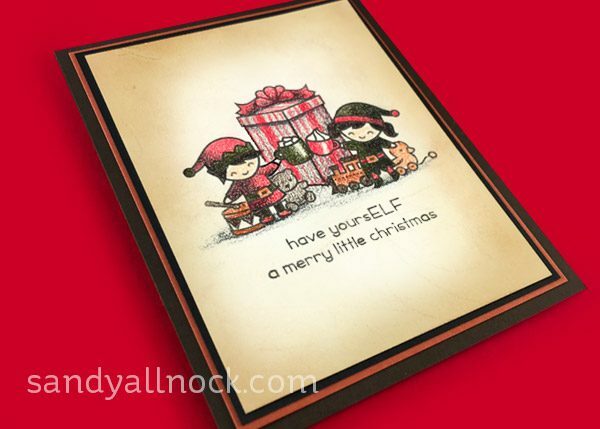 Gives me great ideas for my gifts! Thanks for sharing.